“Altgeld Gardens is really secluded,” Active Transportation Alliance community liaison Cynthia Bell recently told me. “It’s like its own city.” The area, which includes the housing project of the same name, plus the Concordia Place, Riverside Village and Golden Gate subdivisions, is located by a bend in the Calumet River on the Far South Side, surrounded by industrial land and isolated from other neighborhoods. Deloris Lucas, a former Chicago Public Schools employee and longtime Golden Gate resident who’s spearheading the council, has been working hard to change that. In particular, she’s upset that 130th Street, the interstate-like roadway that walls in the community from the north, has no sidewalk. That forces people walking to Rosebud Farm Stand, the area’s only source for fresh produce and healthy groceries, from the west, to trudge along a narrow, muddy dirt trail by the side of the road. The store is located at 525 East 130th. The path is a textbook example of a “desire line,” urban planning lingo for a trail blazed by pedestrians who want to walk somewhere, but haven’t been provided with a sidewalk that would allow them to do it in safety, comfort and dignity. To add insult to injury, drainage issues in the market’s parking lot create a permanent pond that pedestrians have to detour around. To start organizing for sidewalks and other improvements, Lucas and her neighbors formed the STAC in August 2013, with the motto “Safety Is Our First Priority.” Last November, they partnered with Active Trans and the Consortium to Lower Obesity in Chicago’s Children to do a walkability assessment in the neighborhood. The residents surveyed the area, taking inventory of unsafe walking conditions and brainstorming ways to improve transportation access. In addition to adding a sidewalk on the south side of 130th between Indiana and Ellis avenues, the STAC members want to install “Stop for Pedestrians” signs at key intersections. They also hope to get more high-visibility crosswalks striped, especially near schools, plus speed humps, pedestrian-refuge islands and wheelchair ramps. And, in an area where many people rely on the bus in order to travel outside their neighborhood, more bus shelters are needed—right now there are only two. The 130th Street sidewalk is Lucas’ top priority. “Rosebud is our only grocery store,” she said. “Yes, this is a food desert.” Like many locals, Lucas doesn’t own a car. Driving from the center of Altgeld Gardens to the nearest large store with groceries, a Walmart a few miles away in the Pullman neighborhood, would only take seven minutes. However, doing the same trip by CTA requires taking two different buses, a roughly forty-minute one-way journey. “That’s pretty ridiculous,” Lucas says, so unless she’s carpooling with a neighbor, she walks to Rosebud for her shopping. So far, progress on getting the sidewalk installed and the other improvements made has been slow. Last year, the advisory council put in several 311 service requests for these projects, and most of them still haven’t been addressed. The advisory council approached 9th Ward Alderman Anthony Beale about getting the sidewalk built, but he said funding wasn’t available, Lucas says. The lion’s share of the ward’s $1.3 million in annual discretionary menu money was allocated to fix potholes for drivers, she said. Beale has sent a staffer to attend STAC meetings, who has advised the members to talk to the Chicago and Illinois transportation departments about their requests. After we wrap up our interview, Lucas takes me for a short walking tour of the neighborhood. Joining us is STAC member Victor Maurice Flemings, Sr., a lifelong Altgeld resident and union plumber. Flemings was forced to stop working after an injury, so he’s using his time to volunteer with several different community organizations. Approaching Rosebud from the east, we take a wide dirt path next to the store’s fenced-in parking lot. 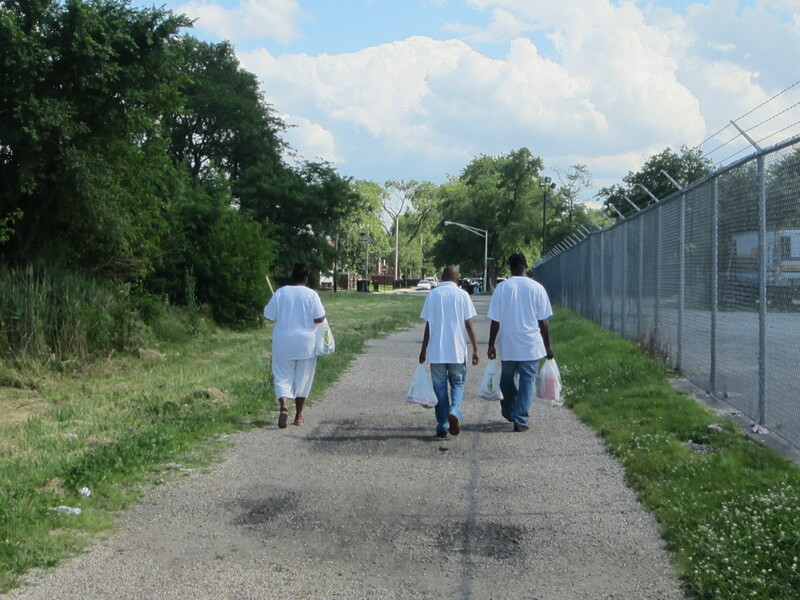 Until recently, it too was a muddy trail, even though hundreds of Altgeld residents use it. However, someone recently lined the path with gravel, creating a better walking surface. “Somebody had some compassion for people on foot,” Lucas says. 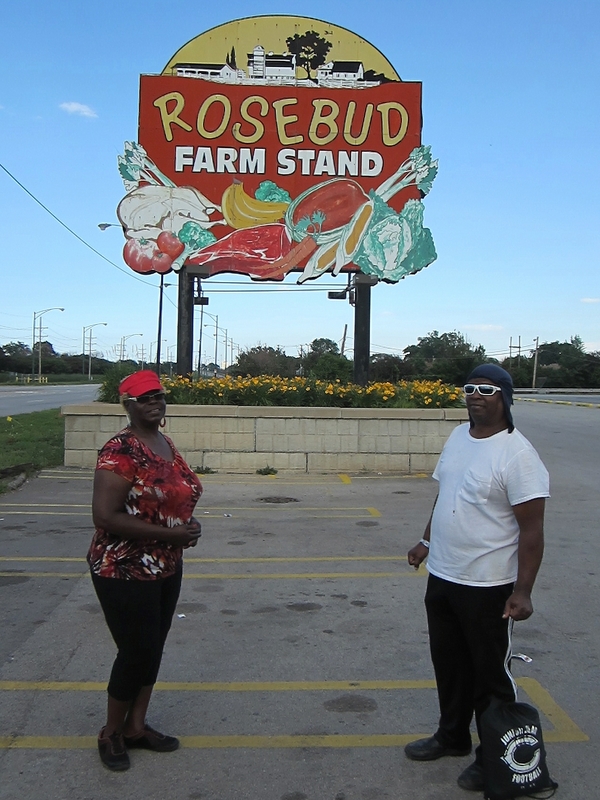 Finally, we come to Rosebud with its old-timey sign featuring a cornucopia of fresh veggies, fruit and meat. The parking-lot pond is still there, as is the dirt trail along 130th, snaking off into the distance. The absurdity and injustice that an important pedestrian route lacks sidewalks is painfully obvious. Hopefully, Lucas and her neighbors will succeed in bringing the matter to the attention of the right people at City Hall, and the result will be a concrete solution.